At left is a 1950’s Italian made CEV “All in One” clamp-on switch. 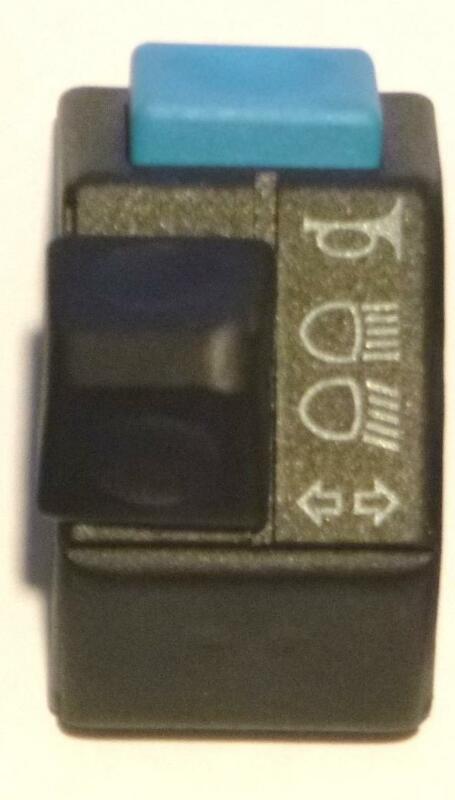 “All in One” means all of the buttons in one switch unit: lights, horn, and engine stop. 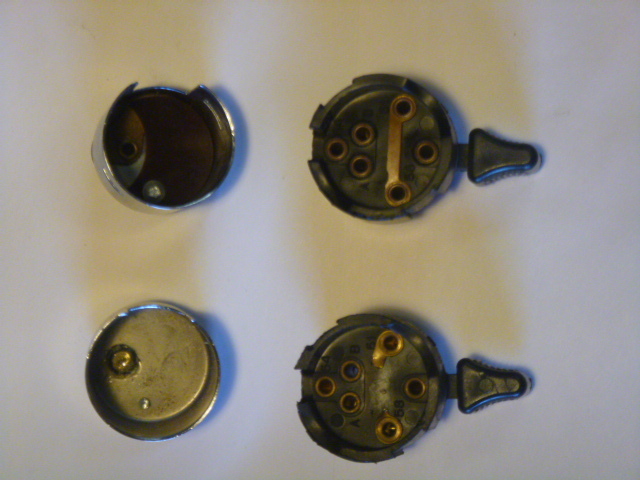 At right is a 1959 Tomos Colibri 4 light and horn switch, polished cast aluminum. In the 1950’s and 60’s Tomos and Puch mopeds were the same. 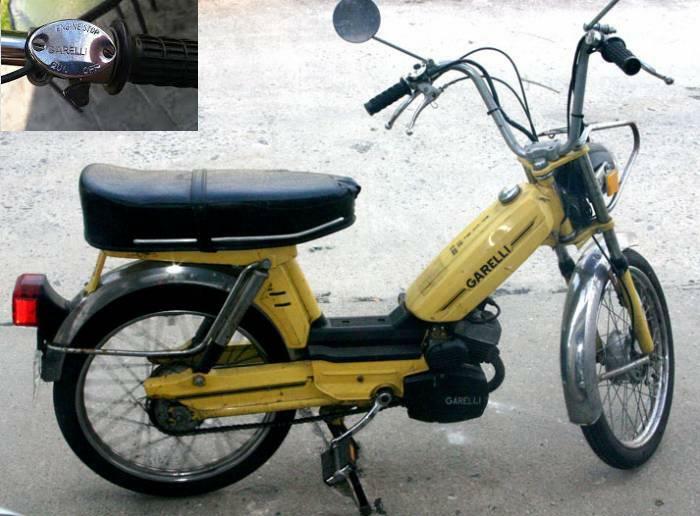 Tomos Colibri was a Yugoslavian “remake” of the Austrian made Puch MS50 series (sheet metal 50). These are shown for information, not for sale. 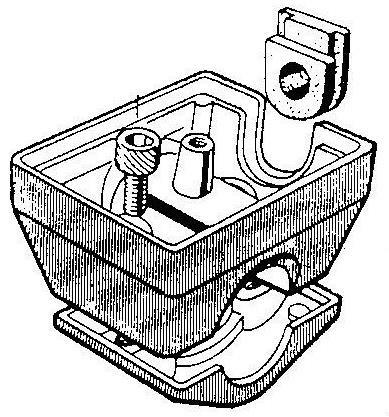 Before 1972 or 73, on motorcycles and motorized bicycles, switches did not have to meet US DOT requirements. They did not have to be in a certain place. They did not have to say what they were for. They did not have to be reachable without letting go of the handlebar. 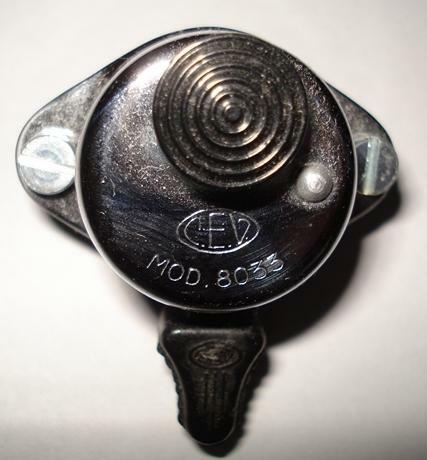 Most 1950’s-60’s mopeds had an “All in One” type switch, either CEV, Aprilia, or others, mounted on the left handlebar. 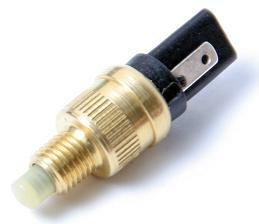 This is a low cost substitute for the original engine stop switch. Pushing the button grounds the ignition wire, stopping the engine. Merit Werke began in Germany 1966, then later moved to Malta, in the Mediterranean. 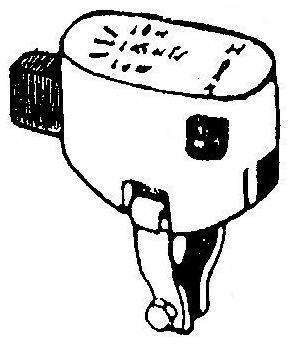 They still make automotive switches, with the same MW logo, but with the name Merit Malta. 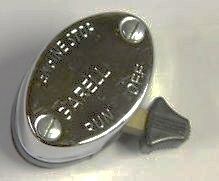 These older or non-US caps interchange with the newer US-compliant caps. 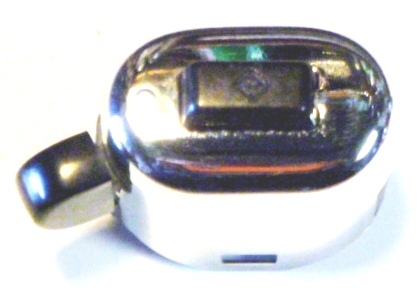 CEV “Diamond Chrome”, also 36mm, but goes in line with the handlebar. This Aprilia “All in One” was original on a 1968 Innocenti Lambretino moped, and dozens more. 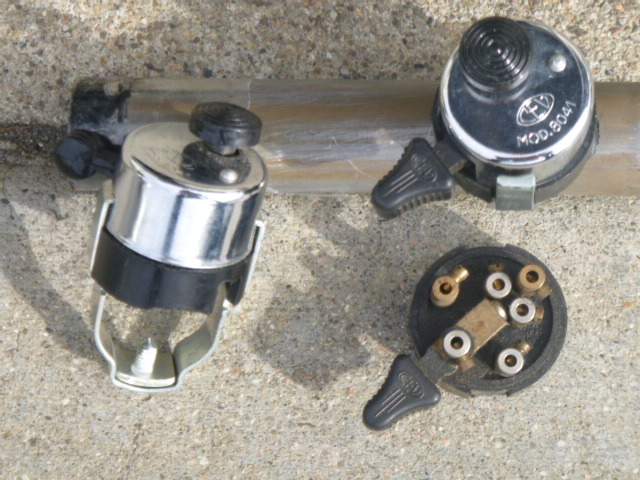 Use with Domino “Diamond” controls, or drill holes in handlebar, to mount directly. 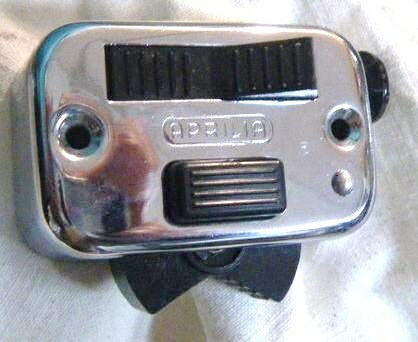 Aprilia “Long Square Chrome”, 38mm, identified by horn rivet on right. 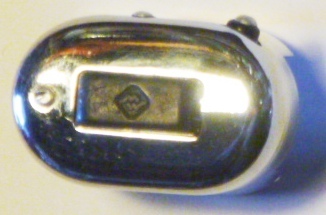 CEV “Long Square Chrome”, also 38mm, interchanges, horn rivet on left. Mopeds (motorized bicycles) had less strict equipment laws than motorcycles did, and still do. They don’t need to have turn signals, or a permanently-on head light. 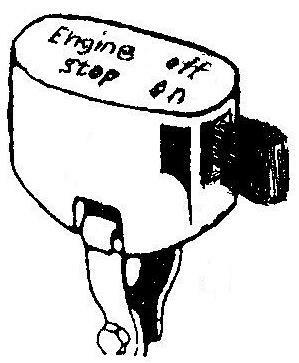 The US DOT equipment laws dictate what the switches do, what they say and where they go. 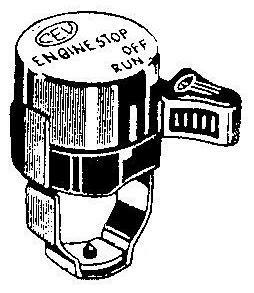 Engine stop always goes on right, reachable by right thumb. 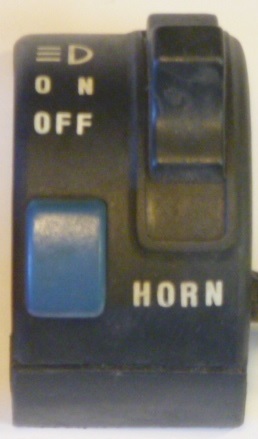 Lights and horn are reachable by left thumb. 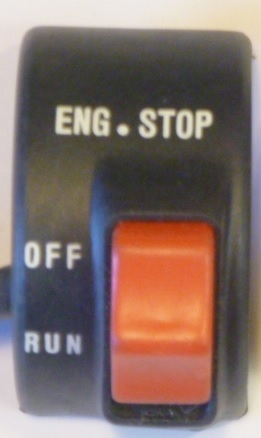 In the 1970’s US DOT compliant switches had English words. After the mid 1980’s US DOT allowed international icons. When the knob breaks off, repair it by sticking a red hot small nail straight in. It freezes in strong. Cover the nail with tape and then shrink wrap. 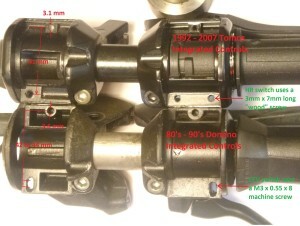 Same clamp as 342. When the knob breaks off, just leave the lights always on. 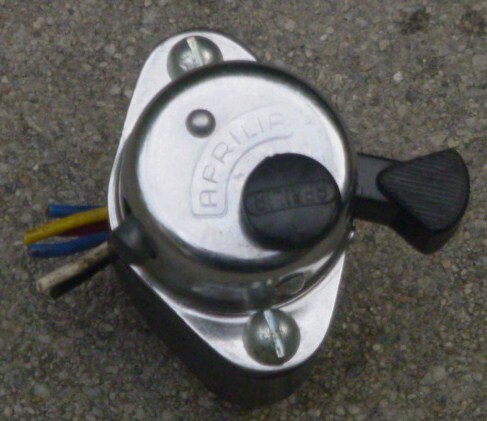 On a pre-1977 Puch, with violet and yellow horn wires, if you remove this switch and unplug the horn the engine will still run. 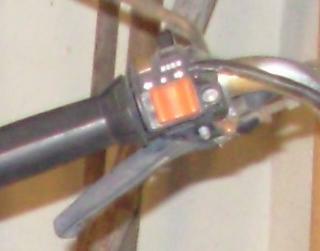 Notice how the 1976 Puch horn wire (violet) goes in at the lower right. Same cap & clamp as 343. If the knob breaks, leave the lights always on. 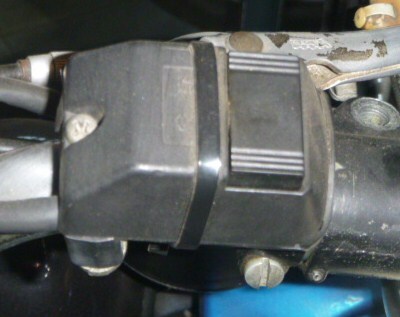 On a 78-on Puch, if you remove this switch, and unplug the horn, the engine will not run. 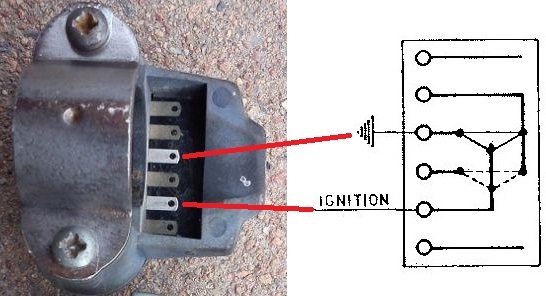 The blue wire with the black stripe is an “external ignition ground” wire. 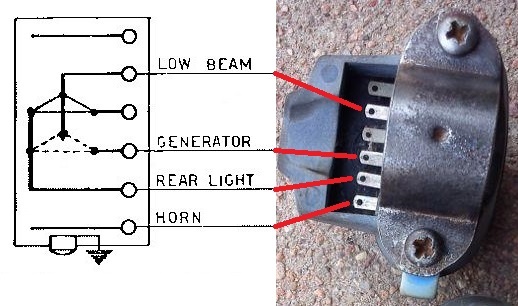 To bypass this, and make it run, ground the blue/black wire at the engine. Notice the 1978 Puch horn wire (blue/black) goes in at the upper right. 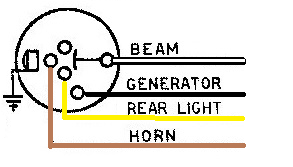 To make a Merit 343Z (2 post) body into a 343, just move the wire to the other post. 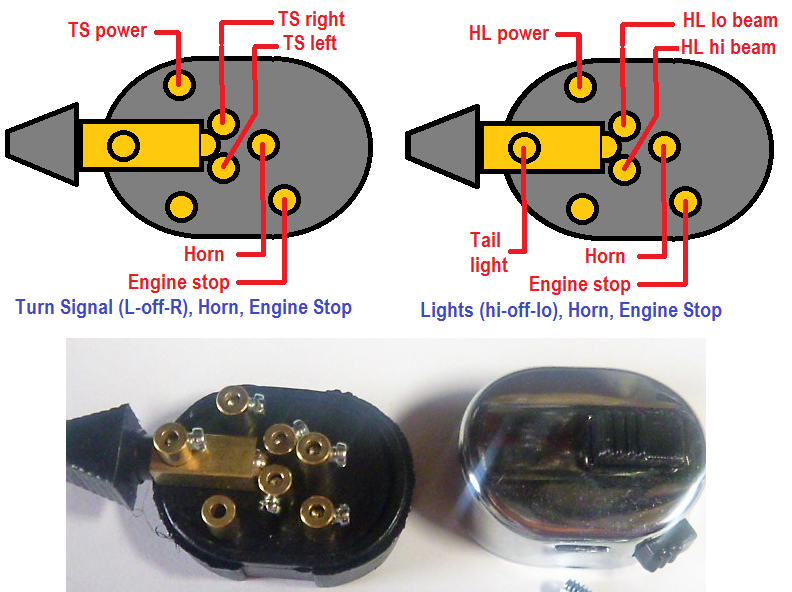 To make a Merit 343 (1 post) body into a 343Z, it is possible, but not easy, to heat up, and relocate the horn post. 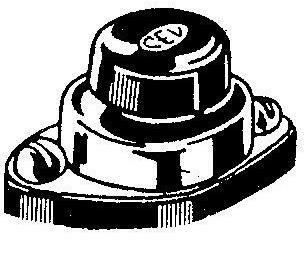 To make a Merit 343 (1 post) or 343Z (2 post) body into a 342, don’t do anything, just exchange the cap. 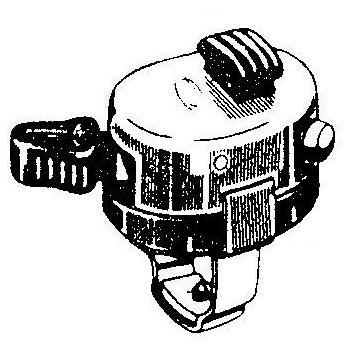 To make a Merit 342 (no post) into a 343 or 343Z, it’s difficult to make and install a post and exchange the cap. 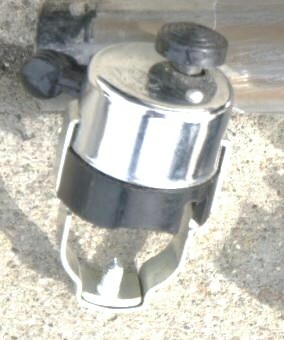 To make a Merit 343 “LO-LO” into a “HI-LO”, cut the brass bridge between the “LO” posts and exchange the cap. The spring gets weak, and/or the rivet gets rusty. 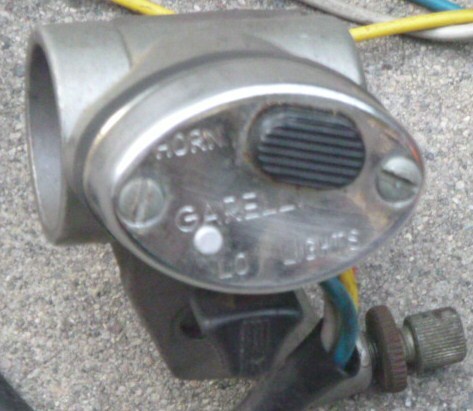 On most bikes, that just makes the horn weaker, but on a ’77-later Puch, that causes the horn to stay on slightly all of the time (so does a loose clamp). 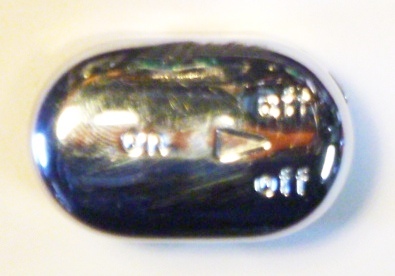 Merit caps have highly polished high quality German chrome. 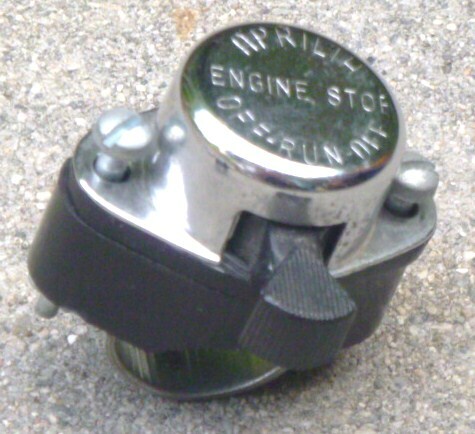 while CEV “Diamond Chrome” switches are mounted in line with the handlebar. 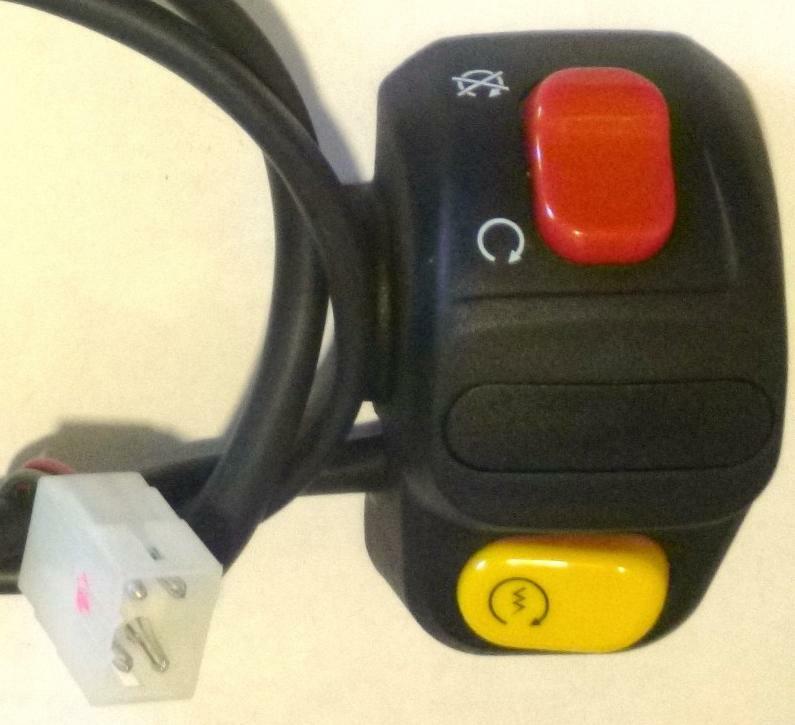 The electric start button is missing on this version for pedal or kick start bikes. 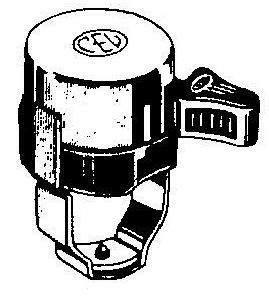 For many 1970’s Italian motorcycles with electric start. 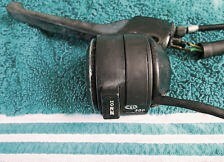 For Cimatti, KTM, Sparta mopeds original with hi/lo head light. For Italian made, pre-1973 US motorcycles, and many others. For Italian made, 1973-later US motorcycles required to have head light always on . 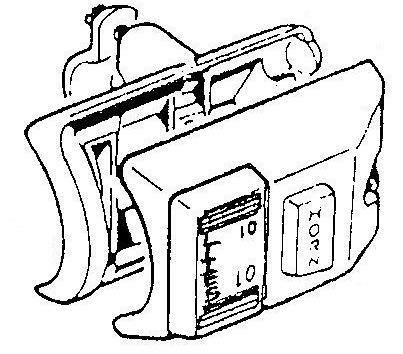 The rails in the switch body, and the steel rollers get cavities from arcing. They can usually be cleaned and made smooth again. 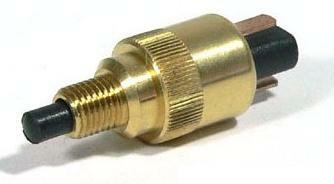 4b roller contact $8 new Make this from a piece of drill bit. 5 switch body $15 new Replace if rails are badly pitted. The substitute clamp holes must be drilled and tapped to M6x1.0, or use smaller bolts. 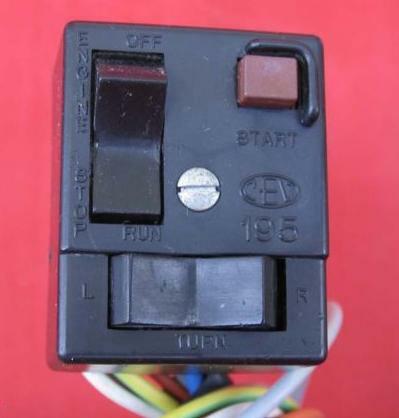 These plastic switches were more durable than older chrome kinds. Their knob did not break easy. Their clamp did not detach easy. 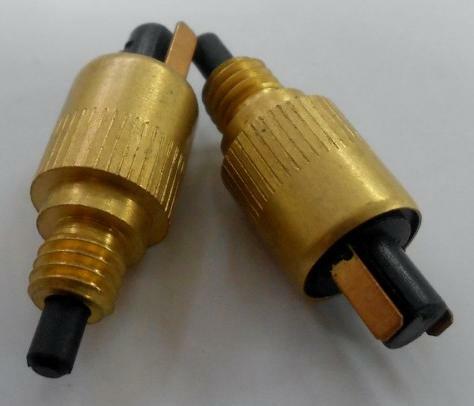 These switches have 3mm wide mini male blade connectors. 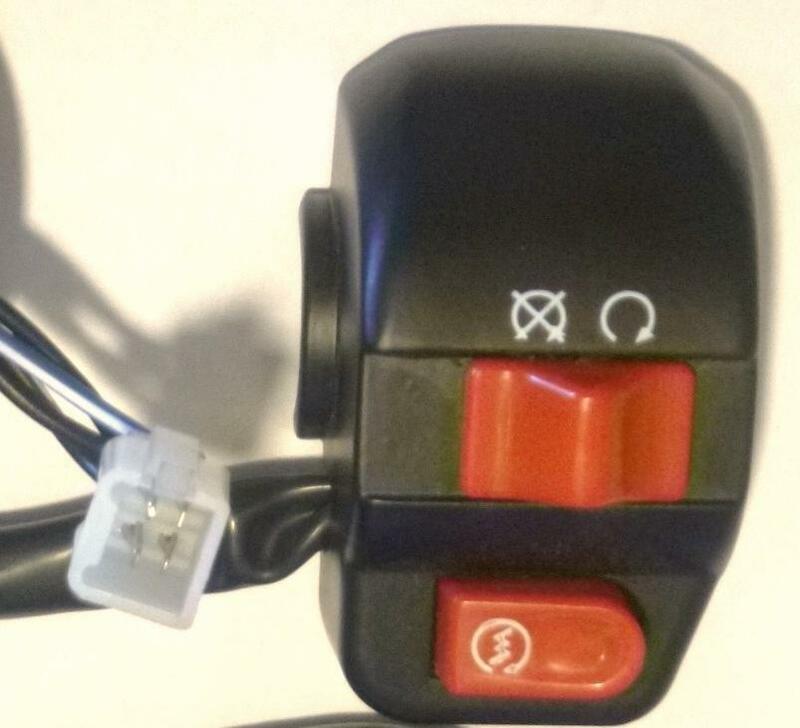 The wires have female mini blades, like the brake light wires. Integrated controls means the electrical buttons and switches are part of the twist throttle and hand levers, rather than separate. 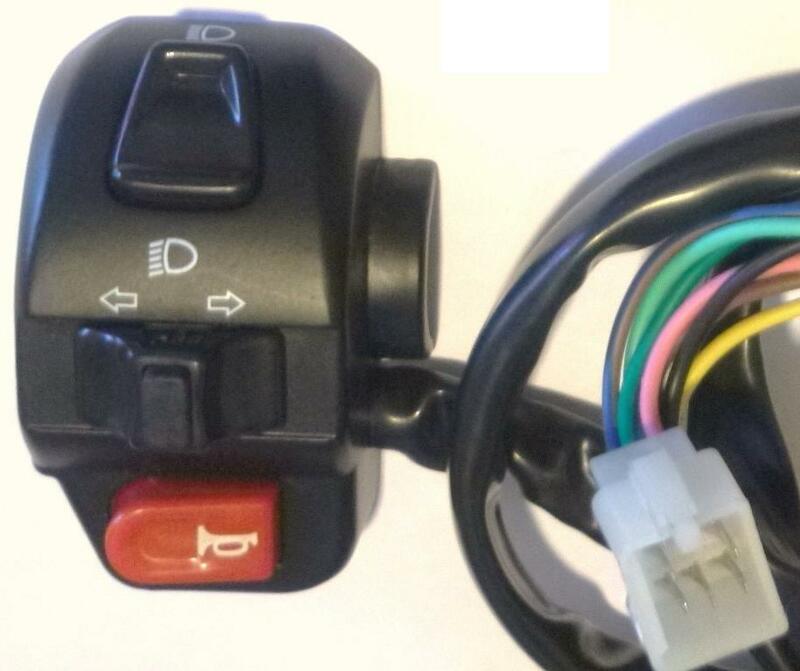 The purpose of integrated controls is to locate the switches close to the operator’s thumbs, for increased safety and convenience, and to reduce cost and save space on the handlebar. Motorcycles had this first, because they have more buttons, generally. 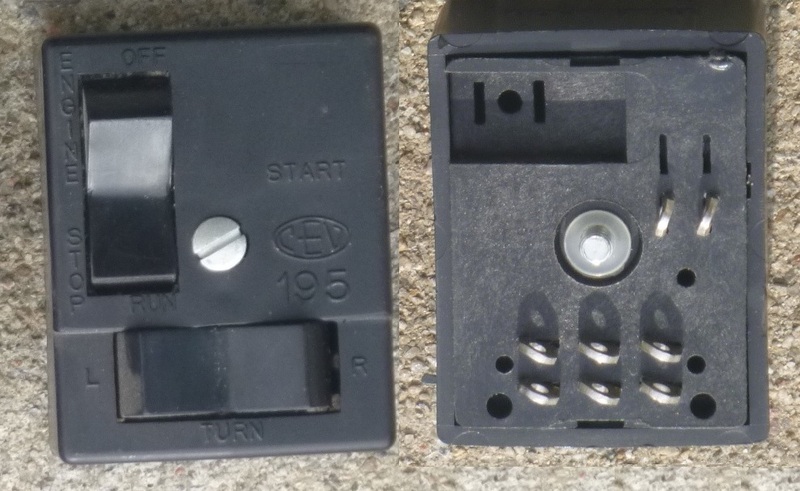 While the European switches below can be replaced separately from the controls, with most Taiwan and Japanese mopeds you had to buy the whole control assembly to get new switches and buttons. More on that will be in the Taiwan Mopeds parts department. 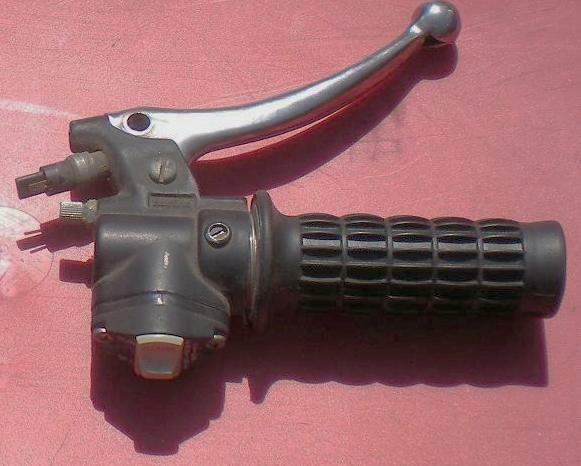 For ’79-83 Tomos Silver Bullet, screwed into handlebar directly, with rubber mount. 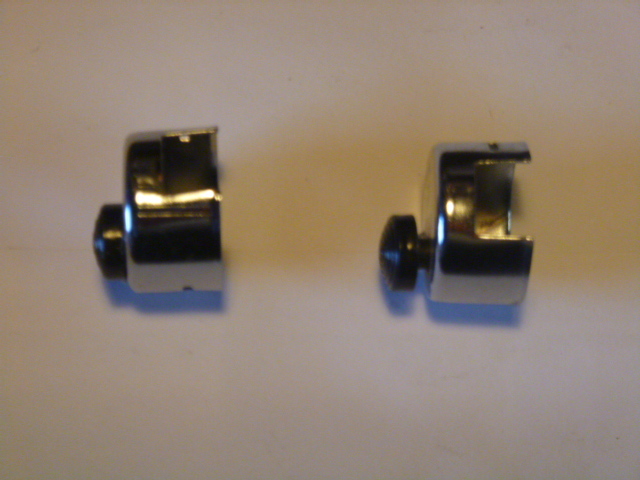 Left, CEV 8191 for Tomos Silver Bullet. The wires come out of the notch in the rubber base. 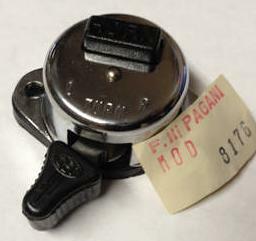 Right, CEV 8191 for Vespa Grande, no rubber mount. 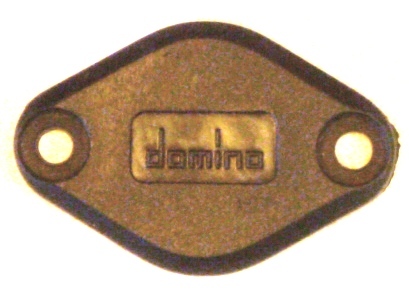 The wire notch is in the Domino control. 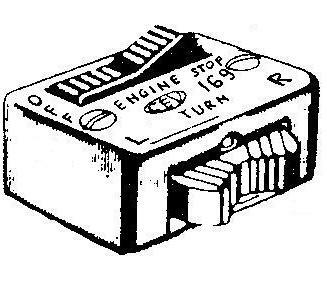 Oval-R $55 Switch only, says “ENGINE STOP GARELLI RUN OFF”. 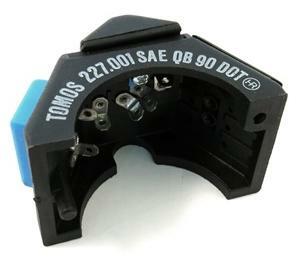 Hole spacing 36mm, same as CEV “Diamond” switches. The pivot post inside breaks if the rider’s knee hits it. Then the “clicker” escapes. 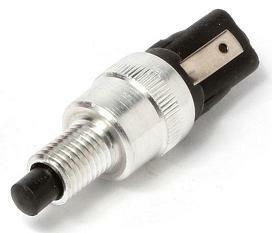 Replace the base with a CEV 8176. Oval-L N/A Switch only, says “LIGHTS GARELLI ON OFF”. Use with Domino “Diamond” controls. takes two M4 x 15 metric screws. 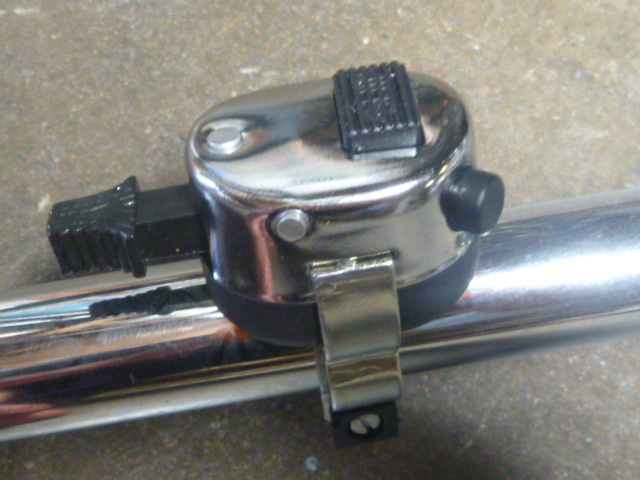 Or drill holes in handlebar, to mount directly, using the “Diamond” Direct Mount below. 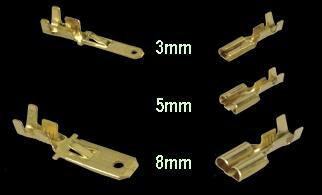 For mounting CEV or Aprilia “Diamond” switches (36mm holes) onto a 22mm bar. 05020? 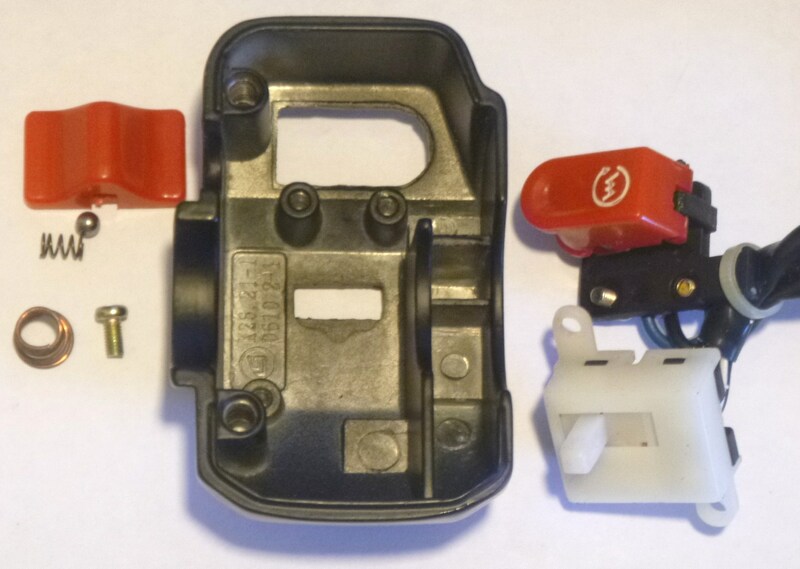 $8 Switch mount, bare, wires come out at right-lower, for left side. 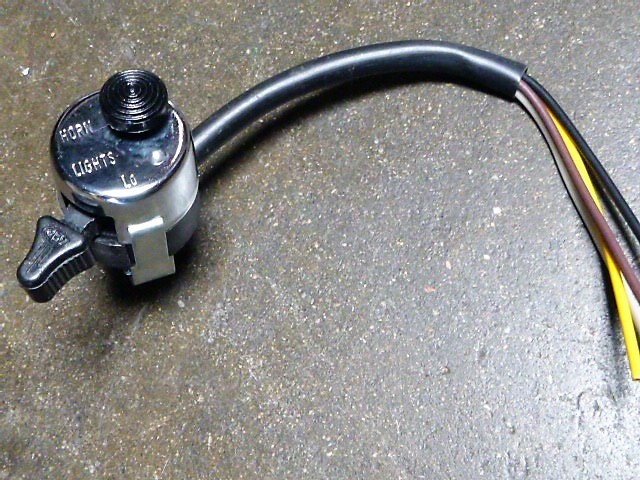 For screwing CEV or Aprilia “Diamond” switches (36mm holes) directly onto the handlebar. 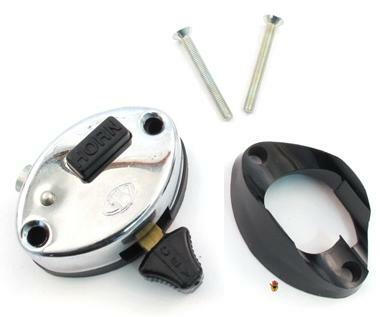 Drill small 1/16″ holes in handlebar 36mm (1 7/16″) apart. 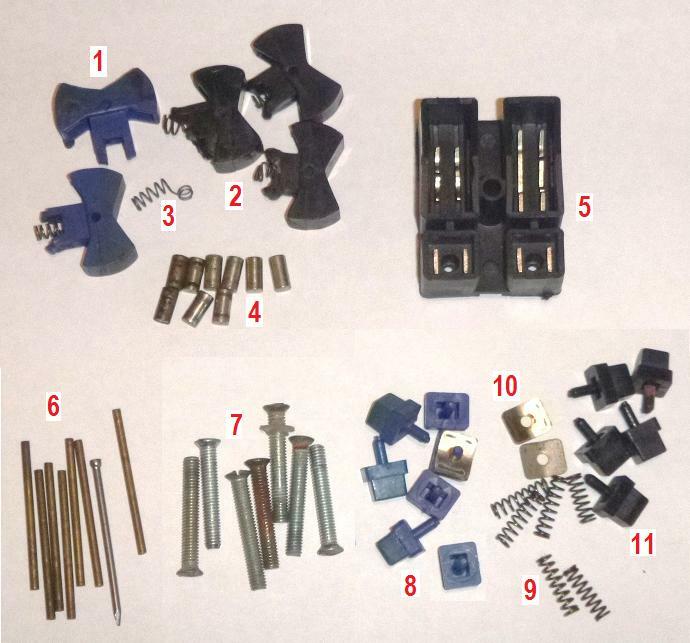 Use sheet metal screws, appropriate size and length. Original on ’80-83 Vespa Grande with blinkers. Or drill holes in bar, to mount directly, using the “Diamond” Direct Mount. By the end of the 1970’s, the shape of pretty much everything from toasters to automobiles, that used to be rounded, was straight. Many things that were metal became plastic. 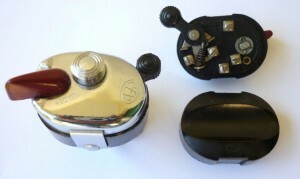 On Garelli mopeds, the all curved Garelli “Oval Chrome” switch shape was modernized to CEV “Diamond Plastic”, with the same 36mm bolt spacing. 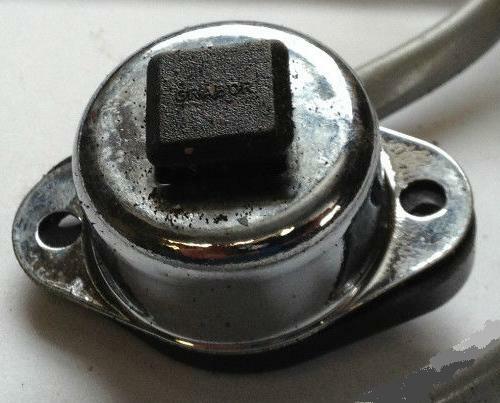 The new design was much stronger and more resistant to breaking, because the sliding switch had a large platform that almost touches the base. The newer “knobs” are low and wide, not tall and thin. Was sold new without wires, which had to be soldered on skillfully. There were not many US-model mopeds in the late 1980’s, other than Derbi, Garelli, Jawa, Tomos, Trac (Daelim), pretty much. 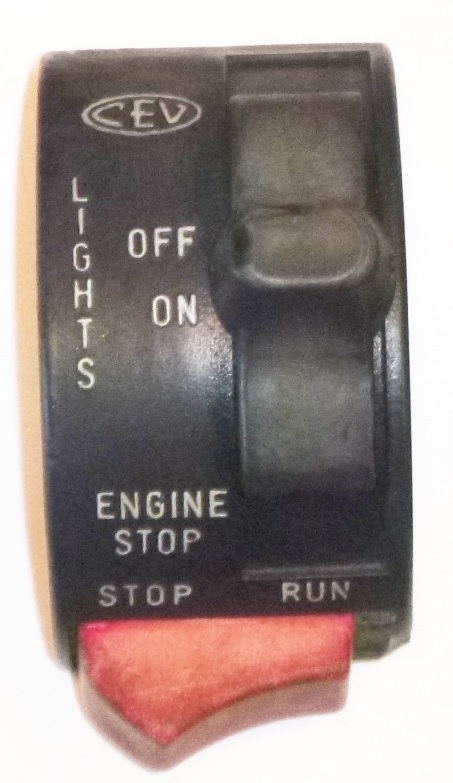 Except for Jawa, they all used late 1980’s black Domino controls with fully integrated switches. Fits any “late 1980’s – 90’s Domino” right control. Fits any “late 1980’s – 90’s Domino” left control. Original on 1986-89 Trac Escot, Liberty, Image (turn signals, kickstart) Fits any “late 1980’s – 90’s Domino” left control. 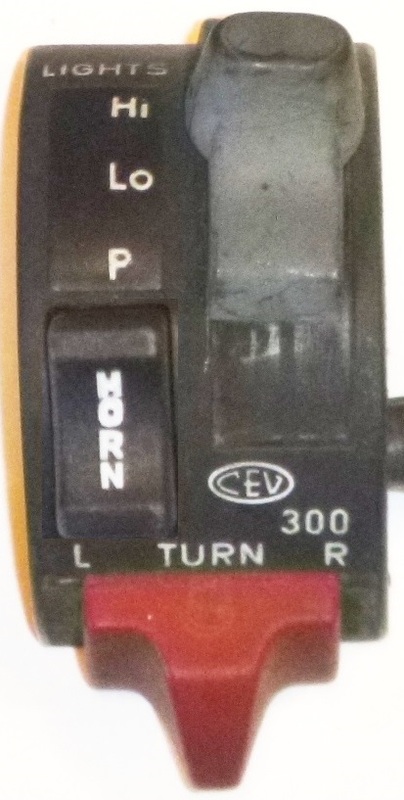 This is the first use of icons on moped switches – 1985. 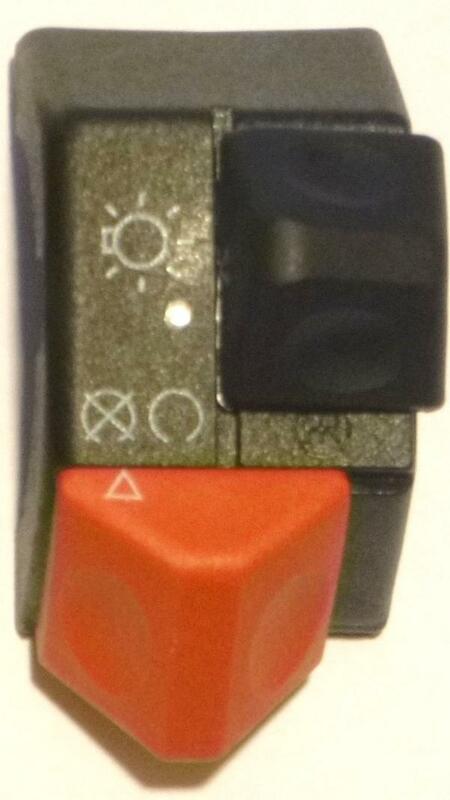 The red switch button breaks, usually from the riders knee hitting it. Fits any “late 80’s – 90’s Domino” right control. Fits any “late 80’s – 90’s Domino” left control. At right, it’s European all-icon cousin. Over there they signal by momentarily flashing their high beam, rather than by horn. So their buttons have different functions. 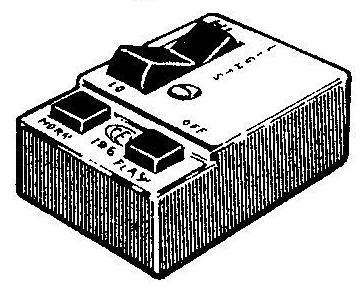 By 1984-85 Europe already had all-icon switches, a few years before the USA allowed them. Original on many late 80’s bikes with turn signals and hi-lo head light. Icons appeared first on US mopeds in 1985 on Trac/Daelim, then in 1987 on Derbi Variant Sport and DS50. 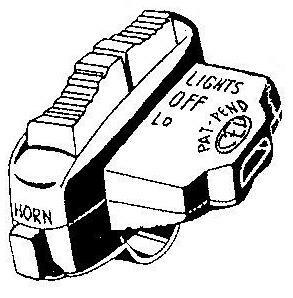 In the 1980’s the world somehow realized it made more economic sense for motorcycle switches to use symbols, with one version for all, rather than using words and having to make many language versions. By the 1990’s the US had switched to icons, at the time when Tomos and Jawa were the only European mopeds remaining. There were several “remakes”: Kinetic (India) is like Vespa/Piaggio, Manet (Slovakia) is like Puch, Hero (India) is like Puch, and others. 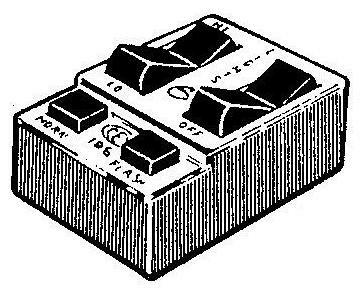 Some of those copied “80’s – 90’s Domino” controls. 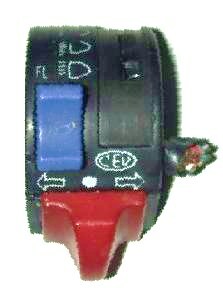 These HR (Hidria Rotomatika) switches below do not interchange with Domino. The HR switches are slightly smaller than Domino, and their top peg is smaller. 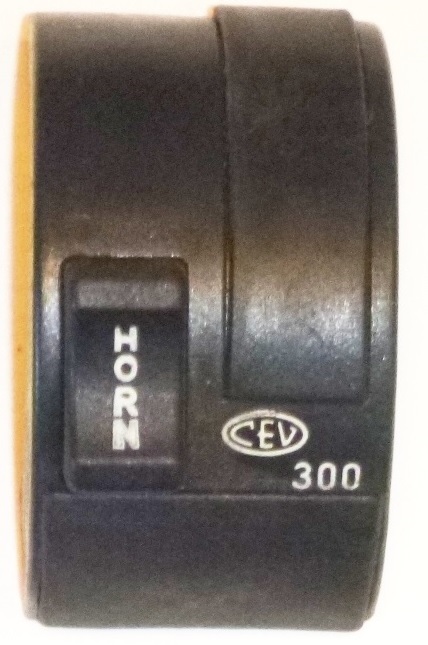 HR switches must go on HR controls, aka “1992-2007 Tomos” controls. Fits any “1992-07 Tomos” right control. Look just below the black light switch to see the circled HR logo (Hidria Rotomatica). Not for US models. 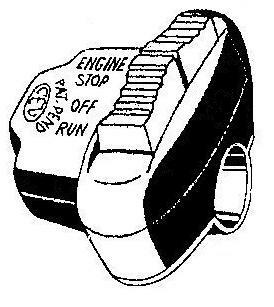 For countries that allow engine stop to be on the left. Fits any “1992-07 Tomos” left control. Many switch problems are from “cold” solder joints. The cure is re-solder. Put away that soldering iron. The new century brings wires pre-soldered by the factory, with a convenient multi-pin plug. 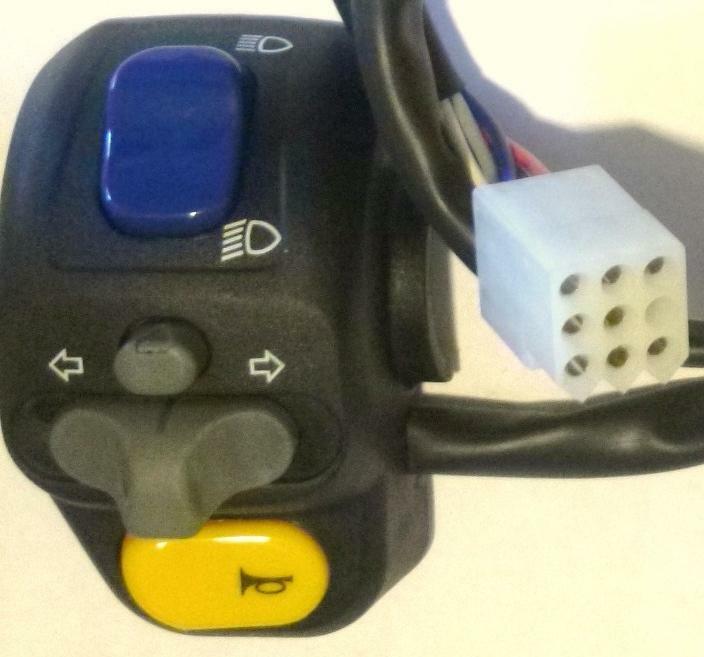 For mopeds, scooters and motorcycles with electric start. Was sold new with wires soldered on, with a single multi-pin plug. Fits any “2000’s Domino” right control. 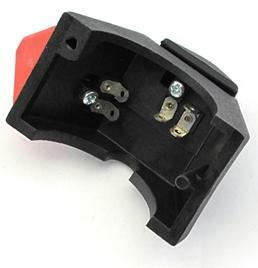 For mopeds, scooters and motorcycles with hi/lo and turn signals. Fits any “2000’s Domino” left control. 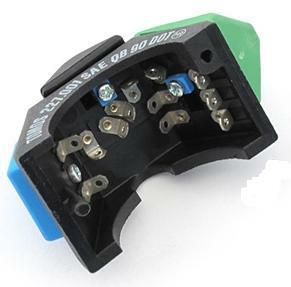 High quality long lasting switches and controls at half the price of Italian. They’re as good, or better. Original on Tomos 2008-13 all models. 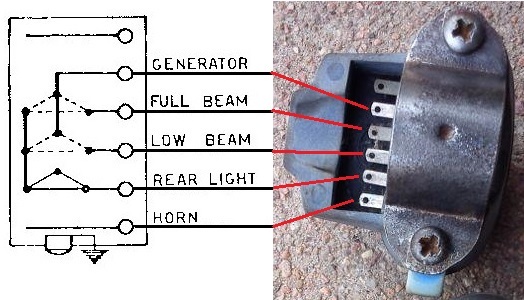 For mopeds and motorcycles with electric start. Sold new with wires and a single multi-pin plug. Fits any “2000’s Domino” right control, or compatible. The TBS plug is different from Domino. See above and Wirings. 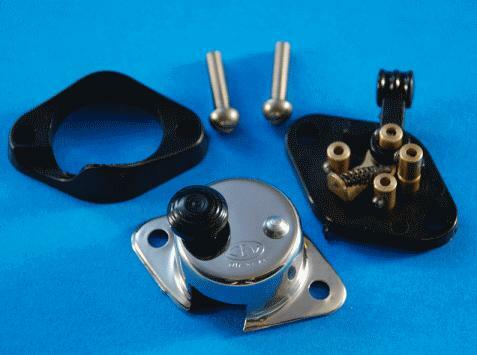 For mopeds and cycles with hi/lo and turn. Fits any “2000’s Domino” left control, or compatible. 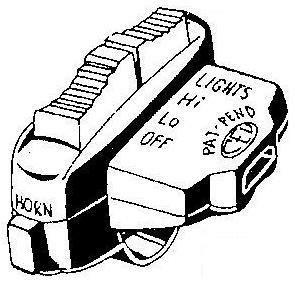 On most mopeds of the 1970’s and 80’s (except Motobecane, Jawa, and Asian-made ones) there were two kinds of brake light switch. They were both made by CEV. 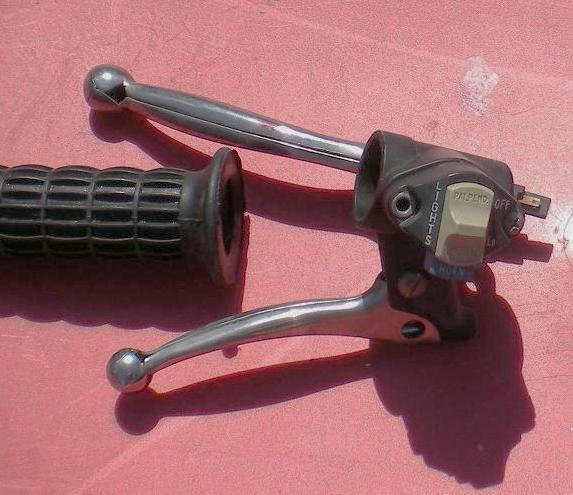 They both screwed into the brake lever perch/mounts on Magura, Domino, OSL, and PV controls, where the button of the switch is pushed by the edge of the hand brake lever. They both have the same physical dimensions and appearance, except for the color of the tip/button. 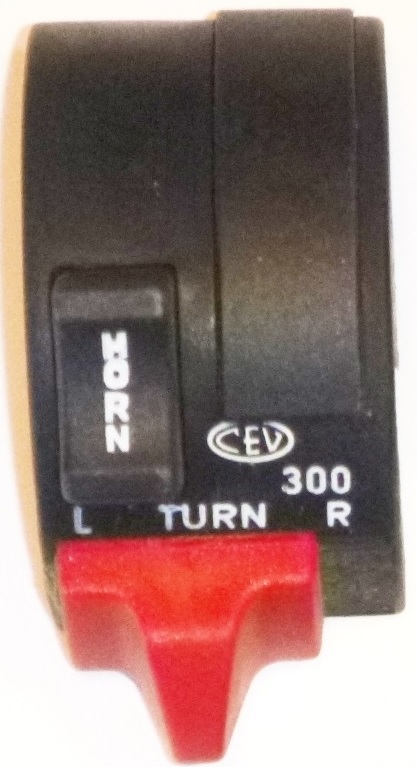 The black button brake light switch was “normally open” when installed, and became “closed” when the brake was squeezed. 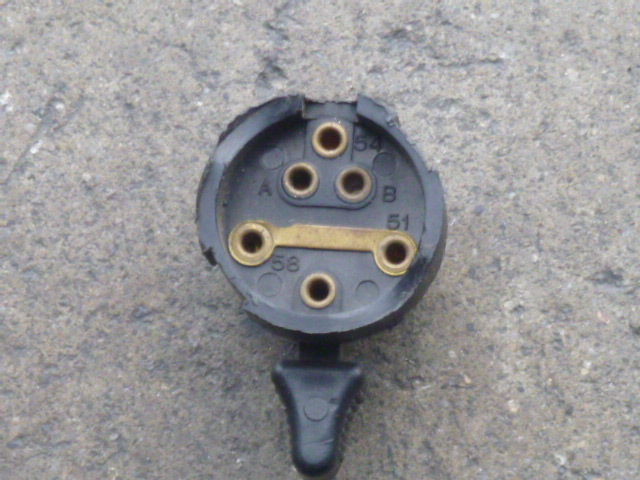 The white or brass tip brake light switch was “normally closed” when installed, and became “open” when the brake was applied. 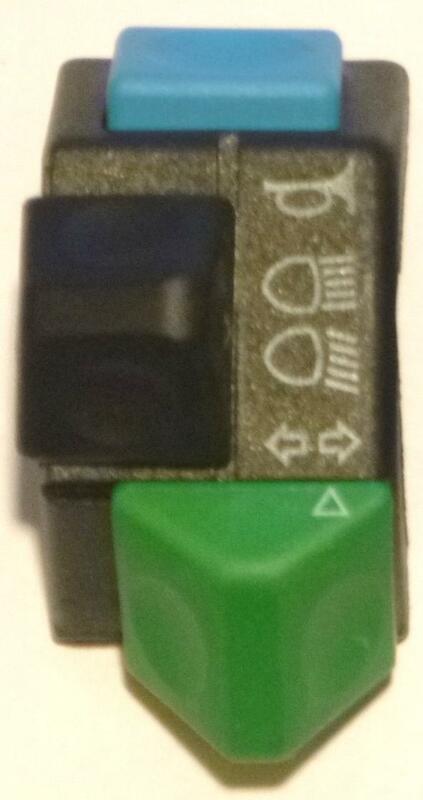 What is confusing is that, unlike most momentary switches, the button (tip) is always being pushed in 99% of the time. 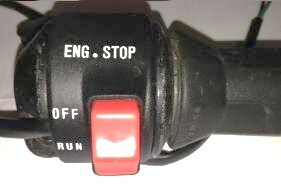 Only when the brake is applied, is the button released. 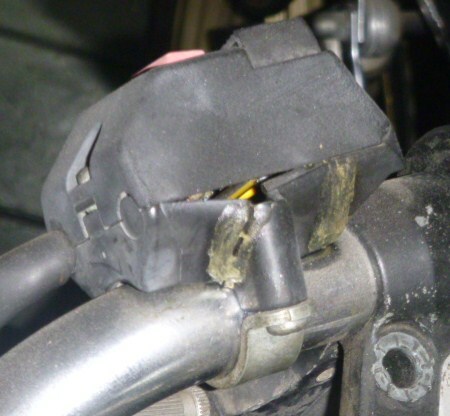 So a switch that is normally open when it is installed on the bike, is normally closed when it is off the bike in your hand. And visa versa. That is why the words “when installed” are added to the switch description. This is a German-made 9343. Looks slightly different, works perfect. 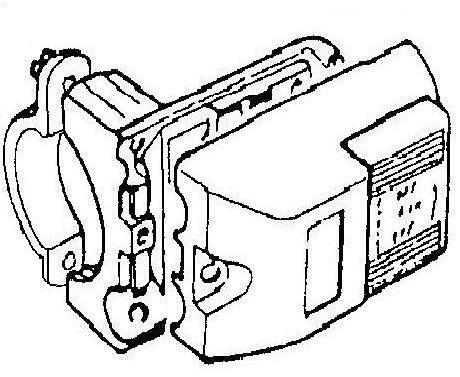 This is a generic copy of a CEV 9343. Looks good but many were bad. In the mid 2000’s these were made correct, like a white tip CEV. But later ones functioned like a black tip CEV, the opposite way. These have a white tip but function like a CEV black tip. For 1992-early 08 Tomos with “1990’s Domino” controls. 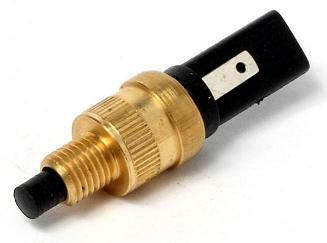 Also for many 1970’s -80’s mopeds, when a small o-ring is added as a “riser”. Unless they are factory-crimped, these need soldering, or they often slip off.